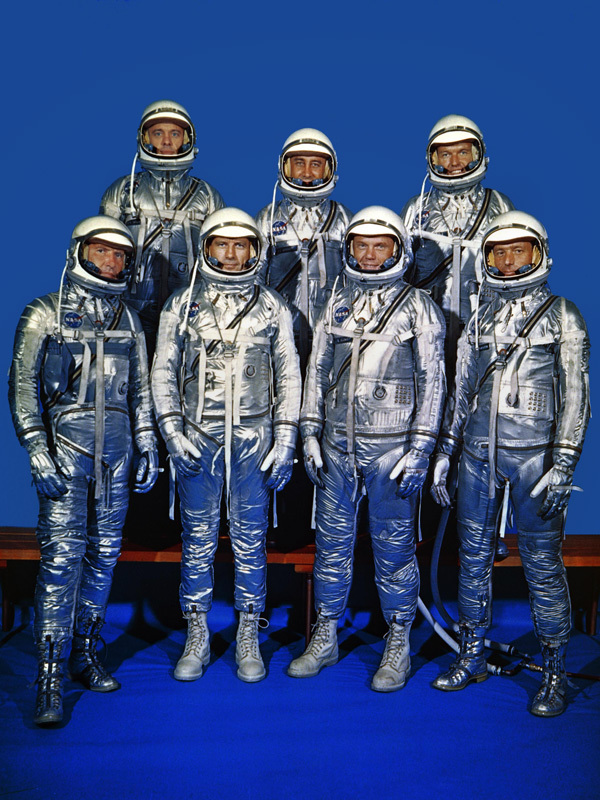 The first U.S. astronauts to venture into space were part of Project Mercury, collectively known as the “Mercury Seven“. That program, which conducted its first crewed flight on May 5, 1961, had fairly modest goals. Primarily, this was to safely travel to and from space, as well as to evaluate how astronauts and their vehicles would function in the microgravity environment. 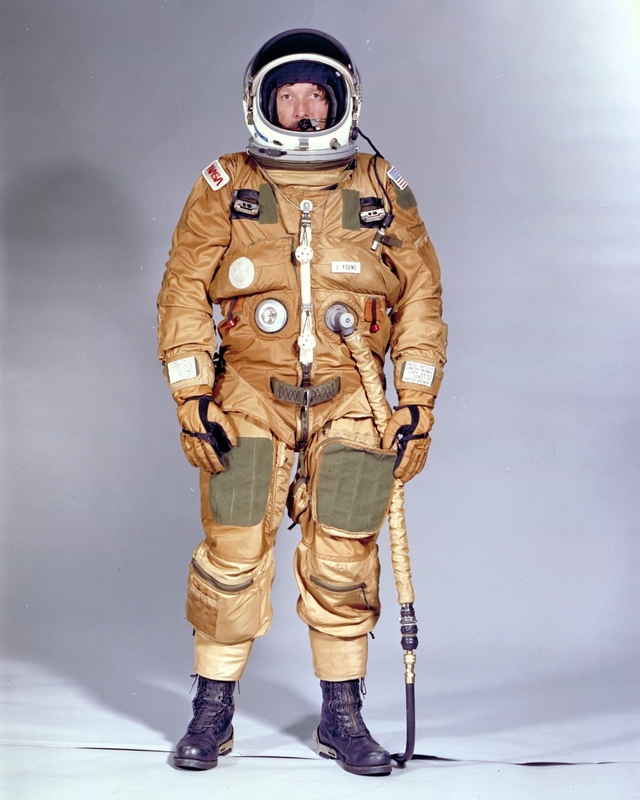 With no actual spaceflight experience to use as a guide, NASA and the Mercury suits’ manufacturer, the B.F. Goodrich Company, used the U.S. Navy’s Mark-IV high-altitude aircraft pressure suit as their starting point. The Mercury IVA spacesuit provided oxygen for breathing and was pressurized in case of an emergency in the capsule; however, it was also designed to be comfortable when not pressurized since the astronaut would have to wear it for the entire length of the mission. The Mercury capsule was very small with no room for changing out of the spacesuit. 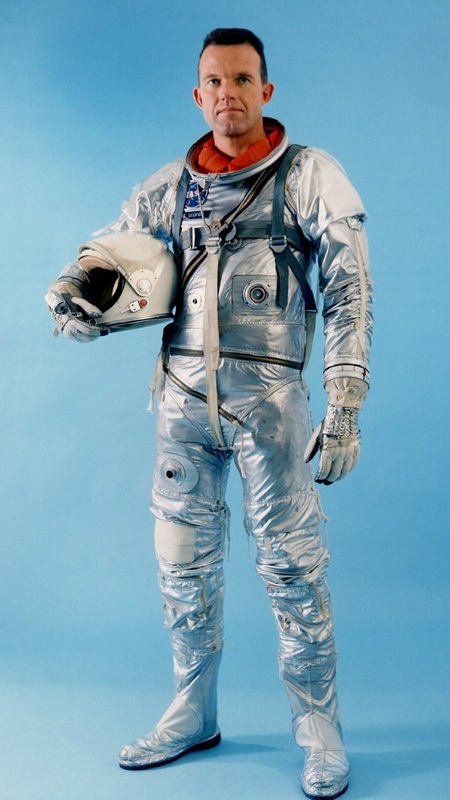 As NASA gained more knowledge during the six Mercury flights, the suit was modified to make it safer and increase its usefulness. For example, flotation devices were added to allow emergency evacuation of the capsule after splashdown. Also, lights were added into the fingertips of the gloves so the astronaut could see the capsule controls easier while on orbit. The helmet protected the astronaut and allowed for movement of the head up and down when the suit was not pressurized; however, when the suit was pressurized, the astronaut was unable to move his head, raising complaints that led to improvements for the next generation suits. Following the successful Mercury program, NASA moved on to the two-man Gemini program. The Gemini capsule would allow for a more ambitious set of goals, including longer duration spaceflights. 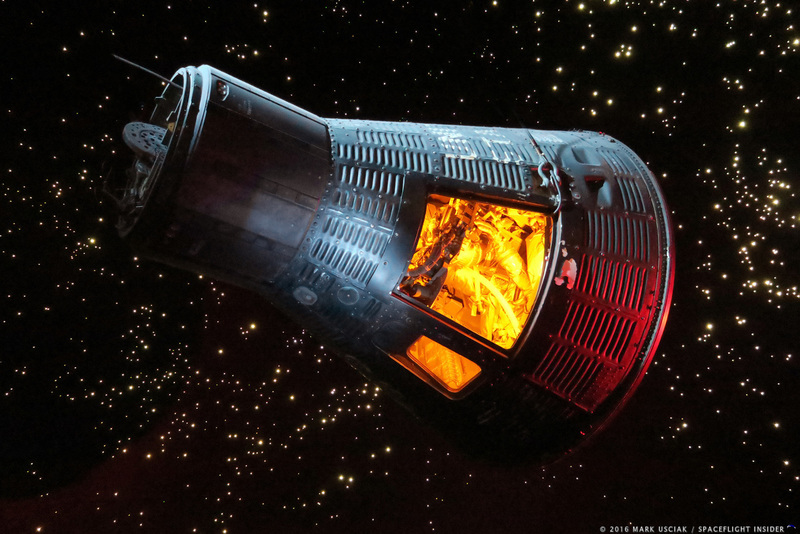 The longest Mercury mission lasted just 34 hours, while Gemini flights were scheduled to last up to two weeks. Other goals included the docking of two spacecraft and, perhaps most importantly, spacewalks in the deadly vacuum above Earth’s atmosphere. Once again, NASA turned to an existing suit design as its basis: the U.S. Air Force’s AP-22 high-altitude aircraft pressure suit. 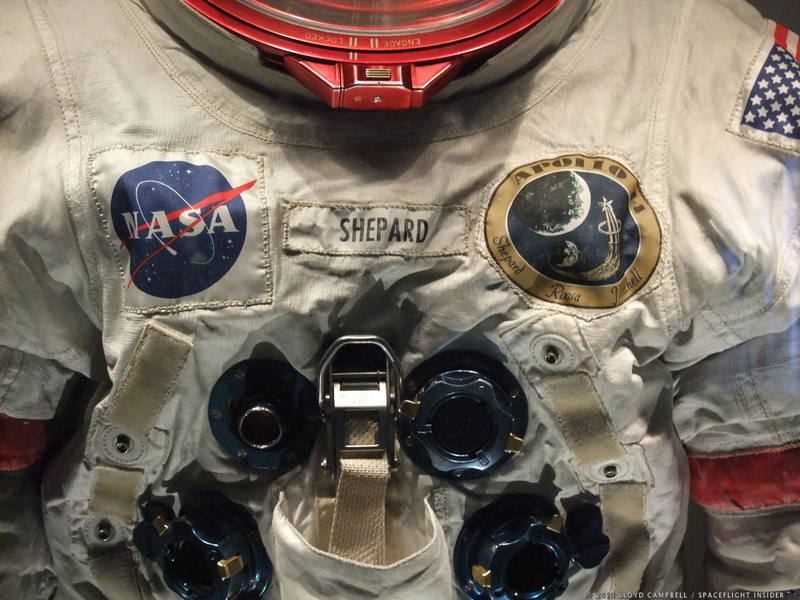 The manufacturer for the Gemini spacesuits would be the David Clark Company. The new G3C (used on just one mission, Gemini 3) and G4C suits would be the first suits designed for use inside and outside of the spacecraft. Weighing in at 34 pounds (15.4 kilograms), it included a parachute as the Gemini spacecraft had ejection seats rather than an escape tower like Mercury. When outside of the spacecraft, the astronaut would be exposed to the possibility of the suit being punctured from micrometeoroids, so the G4C suit was made from layers of nylon and Nomex material. Also, due to the extreme cold and heat outside the spacecraft, thermal protection in the form of additional layers of Mylar was added to the G4C. Life support and cooling for the suit were provided through an umbilical that connected to the Gemini spacecraft. The suit used a lace-up system on the back of the gloves to keep their shape when pressurized. As the program progressed, additional adjustable straps were added to make them more comfortable when pressurized. When Project Gemini concluded after 10 successful flights, NASA moved quickly into the Apollo program that would place men on the surface of the Moon. Ultimately, Apollo spacecraft engineers settled on a Command Module design with an inward-opening hatch, making EVAs impossible for early flights. So the first Apollo spacesuits were modified Gemini spacesuits. The Apollo A1C spacesuit that emerged had its parachute discarded since Apollo used a Launch Escape System rather than ejection seats, and it was replaced with a new flotation device. Other minor changes included changes to electrical and environmental connectors as well as a change to Plexiglas for the helmet visor protective cover. 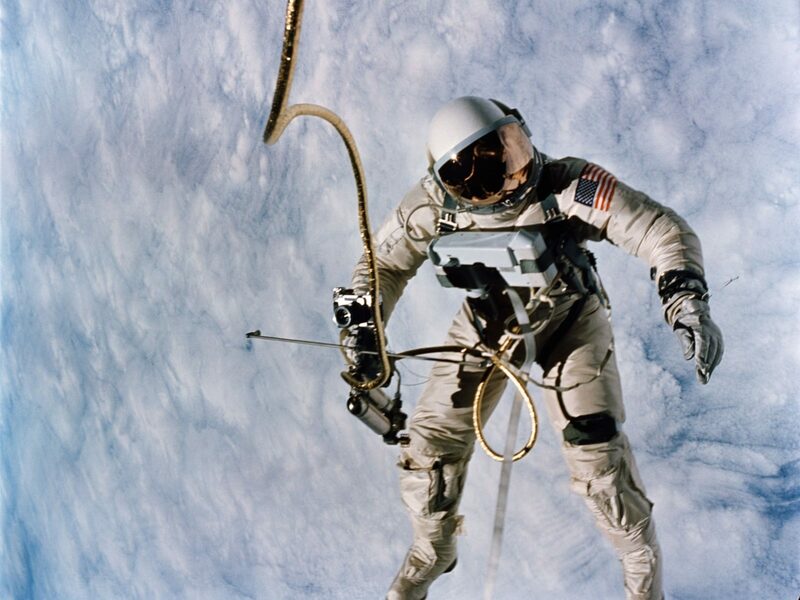 After the Apollo 1 fire, which killed astronauts Gus Grissom, Ed White, and Roger Chaffee, it was determined that the A1C spacesuits had burned through, so NASA incorporated fireproofing for the next generation suits. The lunar EVA spacesuits would be entirely new, not based on any previous design. The A7L suit, manufactured by ILC Dover, would be the first spacesuit not completely customized for each individual astronaut. The suit would be used both inside the Command Module for launch and on the later “J” missions for spacewalks and excursions on the lunar surface. The new, very bulky suits were removed and stowed during a good portion of the mission. Life support was accomplished in two ways via umbilical connection to either the spacecraft or a backpack-based Portable Life Support System (PLSS). The PLSS provided Oxygen, removed Carbon Dioxide, provided cooling, and regulated humidity in the spacesuit. The backpack also contained an Oxygen Purge System (OPS) which, in the event of a PLSS failure, provided the astronaut with up to 30 minutes of breathable oxygen for a quick return to the Lunar Module. One of the few custom-made pieces each astronaut had were the Intra-vehicular gloves that were used when the suit was in use inside the spacecraft. They were custom made from molds of the astronauts’ hands to help make them easier to maneuver. Inside a pressurized suit, astronauts not only worked against the material but also against the pressure that is keeping the suit in its shape, so any change to make it easier to move was welcomed by the astronauts. In addition, the two moonwalkers on each mission had another set of gloves for use on the lunar surface. The bulkier Extra-vehicular gloves were wrapped in a metal fabric called Chromel-R to protect from punctures as the moonwalkers would be using sharp tools and handling jagged rocks. The tips of the gloves were made from silicone, which allowed the astronauts some fingertip sensitivity to help them when controlling instruments. Boots were another item of which two types were required for Apollo. The suits came with boots suitable for use inside of the spacecraft built right into the pressure suit. However, for walking on the lunar surface, a much sturdier boot would be needed that would be more resistant to punctures and provide traction on the lunar regolith. The lunar boots – sometimes referred to as an overshoe – slipped right over the suit boots. Their soles were made of silicone, which provided extra insulation and increased the traction of the boot. The new helmet for the A7L suit was more like a bubble than previous helmets. This allowed an unrestricted view for the astronauts, a welcome change from previous helmets. 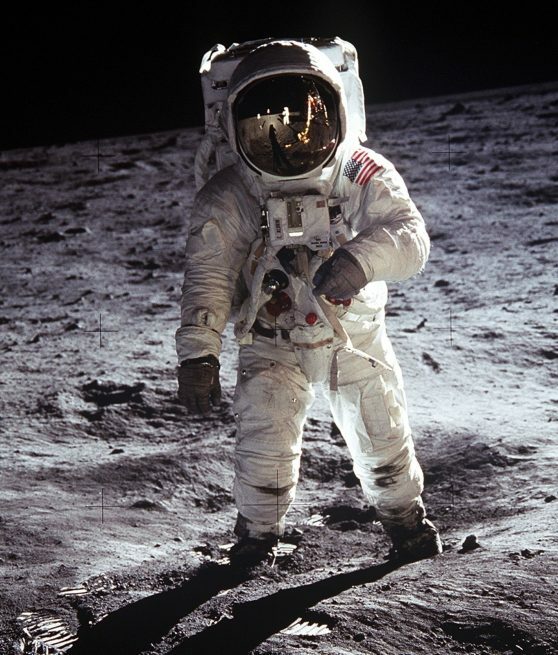 On the lunar surface, the helmet would be covered with an additional outer shell for thermal protection and decreased light reflection, since it blocked light from most of the helmet. It also had a sunshade to protect the astronauts’ eyes. The A7L spacesuit equipped with all its lunar EVA equipment weighed in at a substantial 200 pounds (90.7 kilograms), which made training on Earth quite a workout for the astronauts. On the Moon, in one-sixth Earth’s gravity, it was a svelte 33 pounds (15 kilograms), thereby allowing the astronauts to move quite easily around the lunar surface. The A7L was used on Apollo 7 through 14. The suit evolved once more for the Apollo 15, 16, and 17 missions. These missions, known as “J” series missions, would make use of the Lunar Rover and the astronauts would be out for longer duration EVAs. The A7LB spacesuit had new joints at the waist, which made sitting in the Lunar Rover possible, and new joints at the neck to improve movement. The Life Support System backpacks were modified to carry more oxygen, cooling water, and power to facilitate the longer EVAs. The A7LB spacesuits were also used for the three Skylab missions with some minor modifications. For the Space Shuttle, NASA used a modified version of the Air Force’s SR-71 partial pressure suits for the initial test flights. It was a natural fit since the ejections seats were also the same ones used in the SR-71. The suits differed from later Space Shuttle spacesuits in their orange-brown coloring. Modifications made to the suits for the test flights were few; pressure bladders were added to the legs and the parachute attachments were modified, but otherwise they were the same as the SR-71 suits. 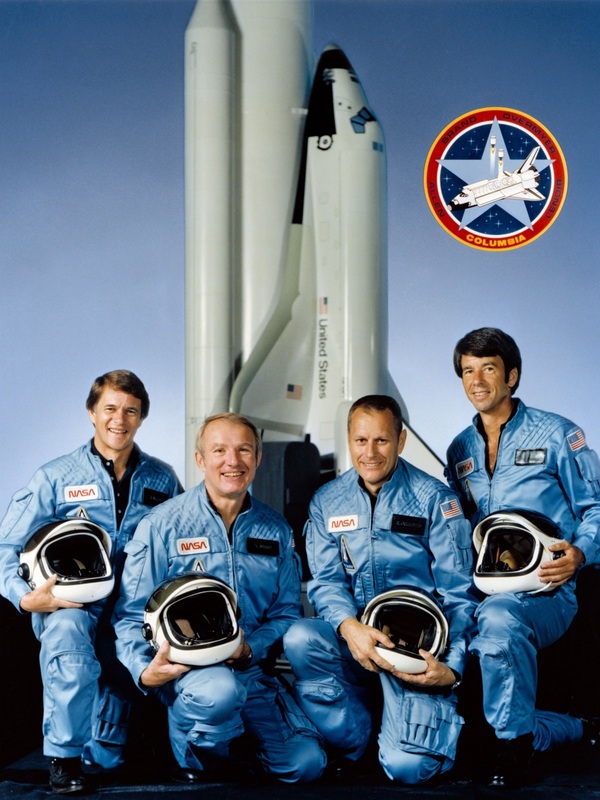 After 4 successful test flights, NASA determined that the partial pressure suits were not required and instead switched the entire crew over to a light blue flight suit with escape harnesses and a helmet. Twenty-one Space Shuttle missions, STS-5 through STS-51-L, all flew with this configuration. After January 28, 1986, when the Challenger exploded 73 seconds after liftoff, NASA’s mindset changed. Beginning with the next flight, STS-26, NASA returned to a Launch Entry Suit (LES) for the crew. 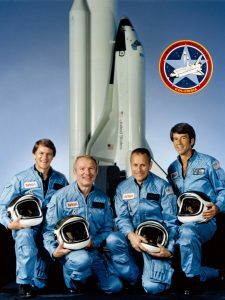 The crew of the Discovery wore a totally new spacesuit, which was nearly identical in function to the SR-71 suit that the first four shuttle crews wore. The new suit, manufactured by the David Clark Company, closed with a rear entry zipper, had a Nomex outer layer, a full pressure helmet, zippered gloves as opposed to ring lock gloves, and a new helmet with a black sunshade that rested on the astronauts’ shoulders allowing them to turn their heads completely side to side. Because of the mobility inside the helmet, astronauts donned a communications cap under the helmet like they did for Apollo. 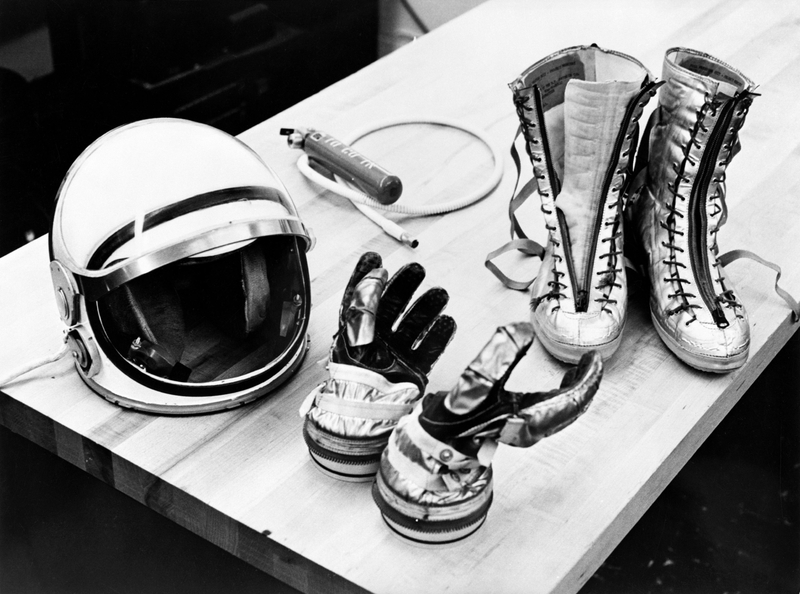 Black lace-up leather boots protected the astronauts’ feet. The suit was rated at altitudes of up to 40,000 feet (12 kilometers); in the event of ditching in the ocean, it could withstand temperatures down to 40 °F (5 °C) for 24 hours. The LES suit was good, but it had limitations as to how well the crew was protected, so NASA introduced the Advanced Crew Escape Suit (ACES) in 1990 and used it until the end of the Space Shuttle Program in 2011. ACES was once again based on a U.S. Air Force suit, the S1034 high-altitude pressure suit. 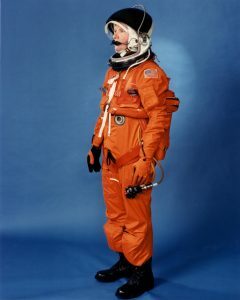 The “Pumpkin Suit”, as it was nicknamed, was designed to help the astronaut in the event of an emergency during launch or landing and was manufactured once again by the David Clark Company. The suit was rated at altitudes of up to 100,000 feet (40 kilometers) and the bright color, known as “international orange”, was used to add visibility in emergencies. It had its own parachute system, automatic flotation device, a life raft, and other survival gear in the various pockets. The suit itself weighed just 28 pounds (12.7 kilograms); however, with survival systems, it weighed nearly 100 pounds (45.4 kilograms). The exterior material was flame resistant. Underneath the ACES suit, the astronauts wore blue thermal suits, which were lined with water coolant tubes. The helmet was the same as for the LES suits and attached via a lock ring. Once again, the astronauts wore communications caps under the helmet. The gloves were, as before, lock-ring attached, which made putting them on much easier and quicker than the zippered version of the LES suit. The gloves also had a new grip material to allow operation of the shuttle’s various controls and ball bearings in the lock rings to help with wrist mobility. At the bottom of the suit were two black all-leather boots featuring zips rather than laces. 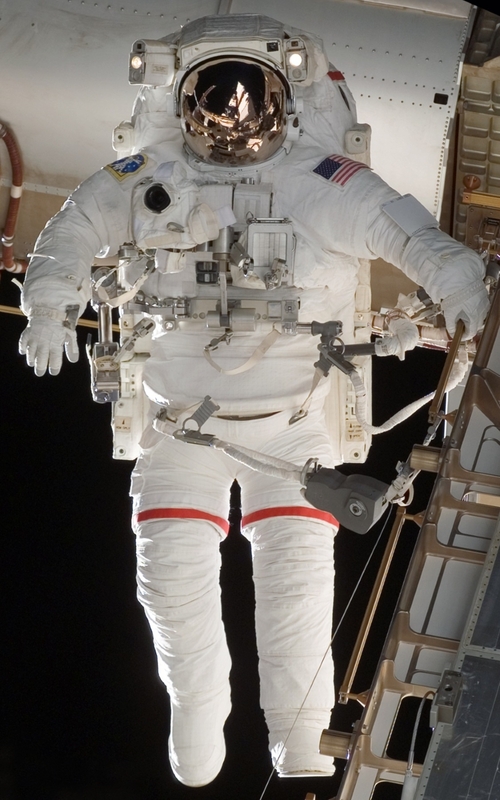 The ACES suit was not designed to be used outside of the spacecraft while on orbit; therefore, since much of the Space Shuttle work required spacewalks, a new spacesuit – named the Extra-Vehicular Mobility Unit (EMU) – had to be designed. The first EMU was used from 1979 until 2002 and an upgraded version has been available since then. EMUs were designed to be modular, where separate pieces are put together to fit an astronaut. There is a selection of bottoms, known as the Lower Torso Assemblies, and tops, known as the Hard Upper Torsos, along with arm sections, gloves, etc., available to assemble an EMU. With just a few sets of these components of varying dimensions, an EMU can be built for almost any astronaut to use. After 25 spacewalks or 15 years, whichever is the greater, the EMU needs to be refurbished, and then it can be used again. The new EMU spacesuit was built using lessons learned from the Apollo flights. It shares similarities to the A7L Apollo suit, such as the Primary Life Support System (PLSS). The PLSS provides oxygen and electrical power to the suit as well as removing carbon dioxide and recirculation of cooling water through the Liquid Cooling and Ventilation Garment worn underneath the suit. It also provides communications and regulates the pressure inside the suit. One of the new features of the EMU spacesuit is the Displays and Control Module (DCM) on the front of the spacesuit. The DCM allows the astronaut to control conditions inside the spacesuit including pressure, temperature, and communications. Having it on the front of the EMU makes it easy for the astronaut to use the controls and the writing on the unit is backward – the astronaut uses a wrist mirror to see the unit, so, in the mirror, the text looks normal. The helmet on the EMU has a large clear plastic pressure layer that is protected with a clear thermal visor, which also protects the pressure layer from impacts. To block out the bright sunshine, the helmet incorporates numerous visors that can be pulled down. There are two visors on the left and right and a full gold covered visor that covers the entire thermal visor when pulled down. It acts like sunglasses for the astronaut when the Sun’s glare is too intense. Once again, a communications cap is worn on the astronaut’s head inside the helmet. The gloves of the EMU have rubber fingertips that give the astronaut have a better sense of touch when using tools. On a spacewalk, in darkness or shadow, temperatures can get down to –250 °F (–160 °C), so the engineers included heaters in the fingertips to keep fingers warm. The EMU continues to work today aboard the International Space Station whenever NASA astronauts perform EVAs in support of maintenance and upgrading of the Station. 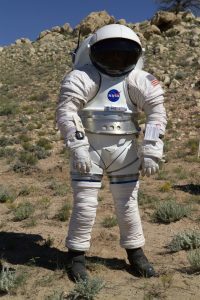 With new missions on the horizon to possibly an asteroid or Mars or even a return to the Moon, NASA and its partners are developing the next generation suits for both launch and re-entry as well as for EVAs. Currently, it appears that there will be unique suits for each. One such EVA suit is the Mark III, which was designed to test new technologies that may end up being incorporated into the spacesuits that astronauts wear when we once again venture out of low-Earth orbit. The Mark III is more flexible than the Apollo suits allowing the astronaut to kneel down to pick up objects. The additional mobility is accomplished by using both hard and soft components, soft joints, hard joints, and bearings in the joints. It takes a lot less effort to move around while wearing the Mark III. It’s a rear entry suit, meaning the astronaut enters through a hatch between the suit and the life support system. This type of entry is much easier than any of the previous EVA suits. NASA’s Commercial Crew partners SpaceX and Boeing are also developing new launch and re-entry suits for their new spacecraft. Boeing recently introduced its radical new suit design to be used when its Starliner spacecraft makes its first manned flight, currently slated for 2018. The blue suit is lighter and more conformable than the shuttle ACES suits while still meeting NASA requirements for safety and functionality. 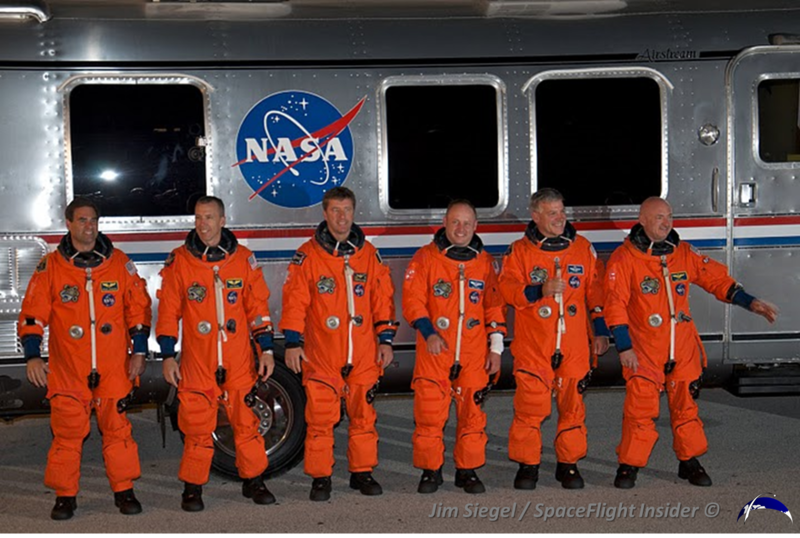 Looking more like something out of a science fiction movie compared to current suits, the advances made since NASA’s ACES suits were introduced over 20 years ago are evident.